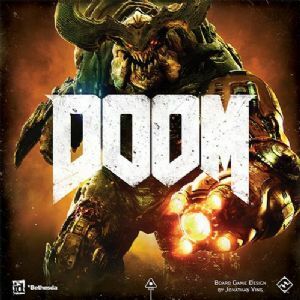 DOOM: The Board Game is strategy board game of tactical combat for 2-5 players based on Bethesda and id Software's video game of the same name. Featuring two distinct player roles, the game brings the epic battle between elite marines and Hell's most threatening monsters to the tabletop. 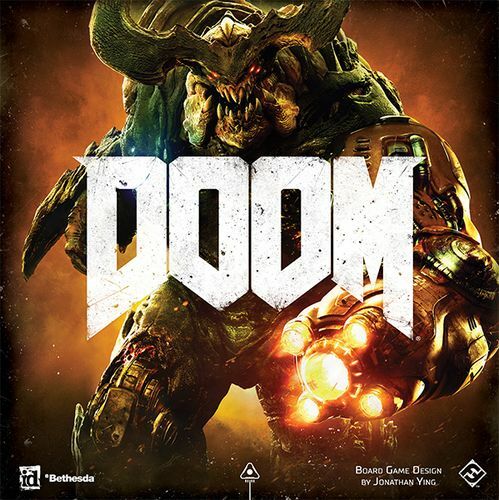 DOOM immerses players in a fierce battle between legions of demons — which are controlled by one invader player — and a cooperative team of up to four marines. The game guides players through two cohesive operations, during which the marines strive to achieve objectives like restoring power to the United Aerospace Corporation's facilities or manning expeditions right down into the pits of Hell. Meanwhile, the invader commands their demons to slaughter the soldiers time and time again in an attempt to protect their fiery domain and destroy all of humanity. The game features custom dice, double-sided map tiles, and thirty-seven detailed plastic miniatures representing four marines and thirty-three demons. It includes two operations, Black Bishop and Exodus, consisting of six missions each.